You know those fun Twitter games like “which Micheal Jackson song are you?” Do you realize what they are really doing? When you login to those third-party sites using your Twitter account, you are granting that third-party site remote access to your account. With remote access, they can send Direct Messages to your Followers from your account without your authorization. Want to see your Followers drop-off rapidly?? One of these Twitter games is doing just that. This site is sending out “Hey, this you?” or “why are you on here? LOL” with a link pointing to a site xsgay.co.uk. Most of these links have been disabled, but your need to think twice about these logins. 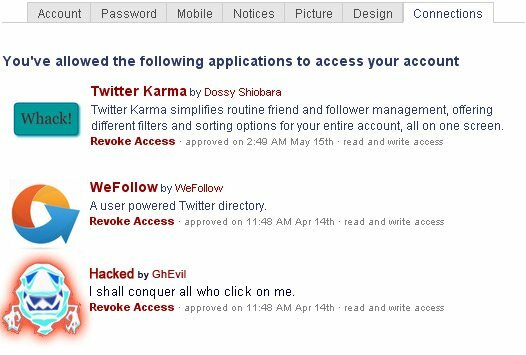 There has even been a Twitter-based Worm called Twittercut which can steal your account info with a click of a link. Go to Twitter.com and login. Click on the Preferences tab. Under the Connections tab, you will see a list of third-party sites which have access. Click the “revoke access” link below the questionable connection. Under the Password tab, change your password. But, there are other Twitter-based scams out there too. The Better Business Bureau issued the following video alert for a Twitter-based money making scheme which promises a 7-day FREE trial CD. Buried in the fine print is the fact that your free trial STARTS from the time of purchase, well before you receive the CD. After the 7-days, you will be charged $100 a month, and yes, they already have your credit card! The BBB has also issued an alert for several of those Teeth Whitening Products promising FREE trails. The alert identifies complaints about Dazzle White, White Smile, Teeth Smile, Dazzle Smile, Ivory White, Ortho White, Max White, My Whitening, Gleaming White Smile as having charged their customers $79 for that free trial, as well as other non-ordered items like a diet product. So before you try “Which member of GLEE are you?”, think before you click!